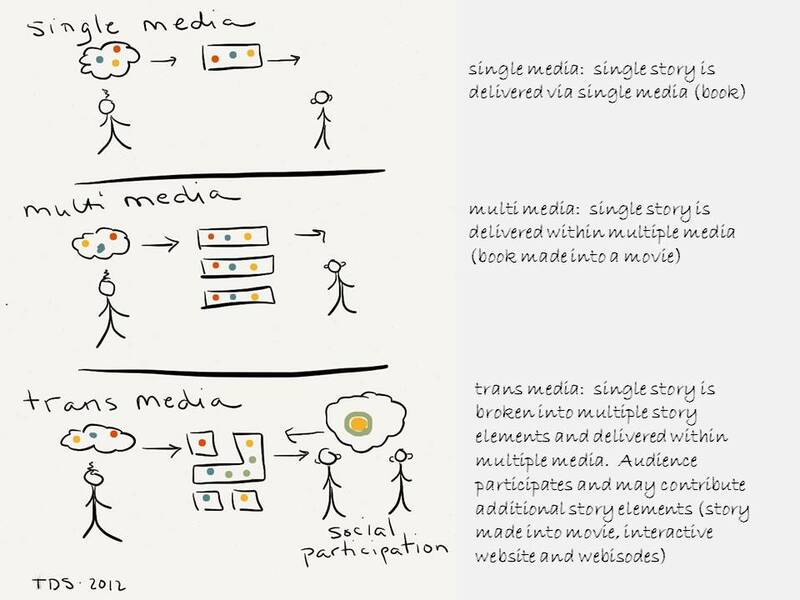 Recently, I tried to explain the concept of “transmedia storytelling” to some marketing friends. I eventually drew this image on my whiteboard. It gives a simplified view of the evolution from multimedia to transmedia and helps convey the ideas of “story elements” and “social participation”. In marketer-speak “story elements” are like “message maps”. Since marketers create message maps, sound-bites, speaking points, etc… we can easily grasp the concept of story elements. Where transmedia breaks the mold is the idea that the story elements are designed to tell a single story across all media. Today, many marketing orgs are very silo’d and story elements are developed that do not roll-up into a coherent story. The idea of starting with a single story and then breaking it into elements for multiple media is a slight paradigm shift. Let me know what else you would add!